Yesterday afternoon, Jackson Galaxy popped online to ask us cat bloggers to spread the word about Meow. Meow recently found himself in the care of the Santa Fe Animal Shelter & Humane Society, in Santa Fe, New Mexico after his 87-year-old human could no longer care for him. On the surface, Meow's story sounds like one of the typical tales we hear in shelters the world over. It's his condition that makes this situation different - and what captured Jackson's heart when he asked us for help to rehome this big guy. And when I say big, I mean over 39 pounds of kitty... on a 12-pound kitty frame. If you do the math, that's the equivalent of a man with an average build who should normally weigh 175 pounds topping the scales at 570. Meow is in desperate need of a seasoned cat lover who will give this two year old boy a home and help him shed the pounds -- safely! -- so he can live a long, healthy, active life. Did I mention the word 'safely'? This is going to be a critical life-or-death part of the equation. Weight loss in obese cats can trigger hepatic lipidosis, or fatty liver disease -- almost always fatal to cats. You can read about it in more detail in the above link, but basically the best way for Meow to shed the pounds is to be on a 'Catkins Diet'. Since cats are obligate carnivores, they need protein and lots of it. No grains, no starch - both of which are found in the kinds of cat food that frequent grocery store shelves. If you know anyone in the Santa Fe area who understands the special needs of an overweight kitty and who might have a place in their heart for Meow, please contact the Santa Fe Animal Shelter and Humane Society at (505)983-4309. Oh I am hoping Meow finds a cat savvy home soon to help him shed the pounds and live a happy life. Poor Meow :-( We hope he will find a loving home and someone to help him!!! No more kibble for Meow, that's for sure since kibble expands in the stomach when it mixes with water. We thought our Timmy was big at 25 lbs. Meow reminds me more of Prince Chunk. I bet if someone opened Twitter and FB accounts for him, he'd get adopted in no time. The shelter got thousands of applications for Prince Chunk and he lived a long and healthy life in his adoptive home, where he safely lost weight. What a fab idea!! I bet he would too! Poor Meow. We are purring and praying that he finds a forever home with a family to love him back to health. I read about Meow a few days ago and posted about him on my Facebook page - I'm glad he is in good hands and getting proper diet coaching! I just hope that whoever adopts him will strictly follow the proper guidelines for kitty weight loss. I’ve seen this story around the internet. That poor puss needs specialist love and care. Hope he gets it soon! Oh bless his little (well big) heart. His ooman loved him a little too much., Poor baby. He's a very handsome boy too. I hope he can find a new home soon so someone can work with him and help him lose weight. It's so sad to see animals get that overweight, and it was done out of love and because she didn't know she was doing wrong. We hope so too. Some people must not realize that it's really - well, cruel to do this to an animal! Mommy just gave Daddy the "Allie is not going to starve in 2 hours if you pick up her kibble" lecture. MOL! 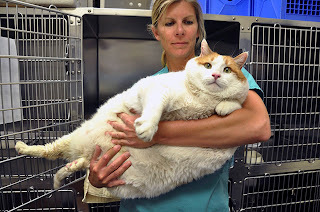 I hope he will find a forever home that understand his needs and now how to handle overweight cat´s ! MOWZERS! Meow's the International Cat of Mystery! We're so glad he's getting that much coverage in the news. We're with you on this - he needs a seasoned cat person to help him through this. Spreading the word on this on Twitter and FB and Pinterest. We need action for Meow! Thanks so much Whskr! We know we can always count on you & Dash Kitten! Oh my gosh... only 2 years old! Still a baby... Paws crossed for Meow! Meow really needs to be off kibbles...probably forever. Canned or homecooked would be a better option for him to lose weight safely....plus exercise, gradually. Poor little guy. We sure hope someone is able to help him. We agree - kibble is not good! Mommy's struggling with Allie (aka Miss Stubborn Pants) about this right now. We rooting for Mommy to win! WOW! That is one hunk of Man Cat! He is as big as my hairy slobbery Sister Bob! Me hopes he finds a good home soonest! We heard about him here in NZ as well. Poor fella, I wish we lived close enough to help. I hope he finds a good forever home out of all the publicity. I heard about the news as well, I hope that she's in a better place. This is worth missing a Wordless Wednesday, or rather delaying it. I sure hope the kitty finds a wonderful person. I will pass this on.